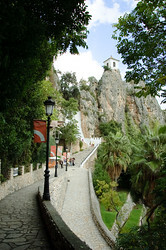 Finally, the second and final part (part 1) or our summer holiday in the Costa Blanca. Once settled into the villa, we did absolutely nothing for two days. The weather was glorious, so we spent the time sunning ourselves, relaxing and taking full advantage of the villa pool. By the 4th, we thought it about time we headed out. The weather was a bit overcast that day, so thought it a prime opportunity to head out and about. That day we opted to venture to our nearest sea-side town (only 20mins away): Calpe, with it's huge rocky outcrop called the Peñón de Ifach. We actually ended up driving right through Calpe and when we eventually stopped, we found ourselves on Playa de la Fossa on the north-east side of Calpe. This side seems to be the newer of the two sides of "the rock" and the nicest in our opinion. We parked and then took a long stroll along the front, turned around and strolled back. We then jumped in the car and drove over to the other side and took a long leisurely stroll along the water front on that side too. The beauty of it not being the middle of the summer hols was parking was not a problem at all. With Calpe beach front seen, we jumped back in the car and headed back to the villa for lunch and a relaxing afternoon by the pool. It was getting a bit late and we were starving. We hadn't planned on being out too late anyway. 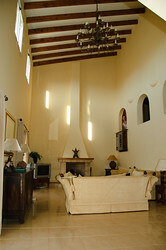 We spent the next day at the villa enjoying the sun and relaxing and then headed to Dénia quite early on the 6th. 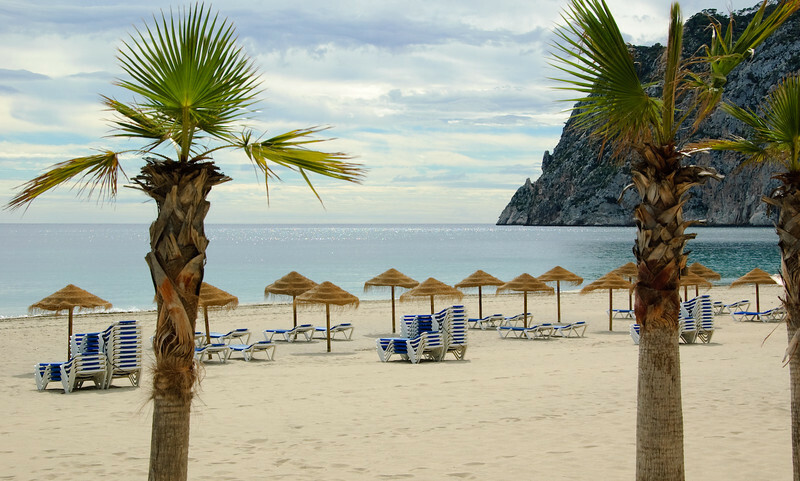 Dénia is a lovely little sea-side town with quite a busy city bit. Some parts of the coast to the south of Dénia marina remind me of parts of the Cape in South Africa. We wondered around Dénia for a couple of hours taking in the sights, oooing and aaaaahing at the lovely yachts in the marina before sitting down for some lunch. After lunch we headed back to the car, moved it closer to the beach and spent the afternoon sunning ourselves on the beach. The beach was lovely. The sea was nice and warm, but a bit sea-weedy. We headed back to the villa after a couple of hours on the beach. We spent the next few days relaxing back at the villa. It was around this time we got to know a very very friendly cat. No idea where it comes from, but it was around almost every day from this point on, so we named it Muffin - a tenuous link back to the Spanish for cat - el gato. 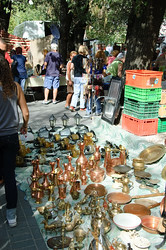 Saturday is rastro (flea market) day in the nearest town to the villa, Jalon, so we thought we'd get up nice and early and head down to town to see what their rastro was like. 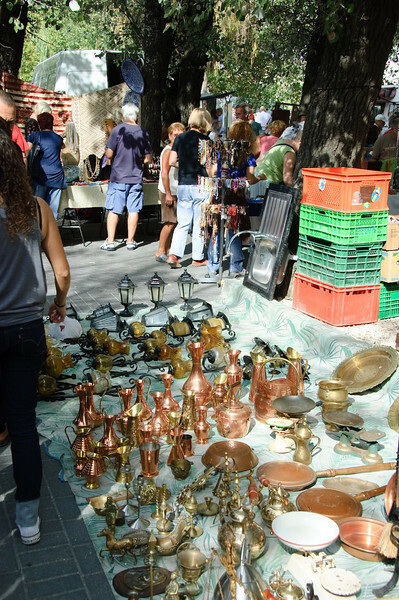 Well, it was interesting and people sell everything from new toys and clothes to any old tat they may have lying around the house including the kitchen sink, literally. That Saturday happened to also be a regional public holiday: Region of Valencia Day (I'm sure it's got a Spanish name, but I can't find it right now) so all the shops, except the bodega (cellars like French caves), were closed too so things were a little on the busy side by the time we left. We didn't buy anything from the market but we did happen to discover a very affordable and popular bodega by mistake. It was the only shop people were going in and out of, and when they came out they all had huge bottles of what looked like red and white wine (we didn't know this was a bodega at the time as this is what it looks like from the front). Once inside we soon discovered quite a huge room with lots of pre-bottled bottles of wine, some very big barrels and several tasting tables from which you could sample the various barrels they had available. Once you had an idea of what you liked, you could either pick up pre-bottled 750ml glass bottles (expensive) or go for considerably cheaper option of a 2 litre or 5 litre plastic bottle, assuming you didn't take your own bottle for a re-fill. We grabbed a 2 litre bottle of rosé and a local sweet fortified wine called mistela pansa which tastes of raisins (this was actually quite nice mixed with some weak lemonade called gaseosa). Once we finished our little bit of shopping we wondered around Jalon itself - not much to see there - and then headed back to the villa to drop off our purchases - we wanted the drinks nice and cold for that evening - and then made our way to Jávea. Jávea is a lovely little town right on the coast with the most exquisite turquoise blue sea - if it weren't for the pebbles and Spanish being spoken you could easily have believed you were in the Caribbean. We ventured around the port side of the town for a bit before settling down for a mediocre lunch on the waterfront. The day had turned out to be quite a hot one, so the shade and a refreshing cold drink was a welcome escape from the sun. After lunch it was back into the car back to the villa via Gata de Gorgos. We stopped here and had a quick look around. This is a very small town with not much to see. It was also winding down from a day of festivities. 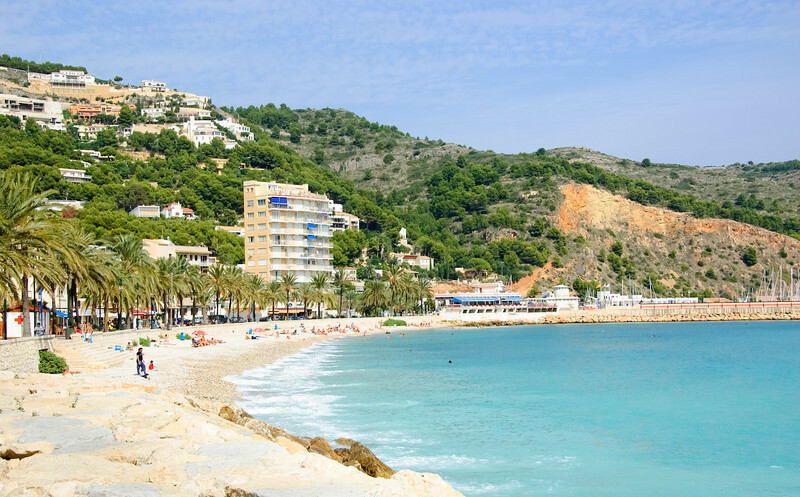 One thing was for sure: we'd definitely be going back to Jávea that holiday. The next morning we were up bright and early to get to Valencia before it got too busy and too hot. 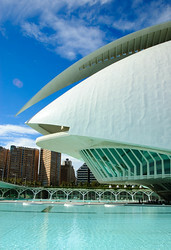 We opted to head to Valencia on the Sunday as it would easier driving to and around Valencia. This turned out to be a great idea. As the Saturday was a public holiday, Sunday was effectively operating as a Saturday with a lot of people out and about and the shops open too. We drove right through Valencia nearly to the port before turning back towards the centre and locating a free spot to park. This ended up being quite a hike from all the action, but it was a glorious day and we didn't know what the parking would be like nearer the hustle and bustle. We then spent the whole day wondering around Valencia taking in the sights and the old part of the city. Valencia reminds me a lot of Madrid in parts, which isn't really surprising given it's also a Spanish city :-) . Valencia also has this lovely long stretch of cultivated park land right through the middle of it. Within this long strip is La Ciudad de las Artes y las Ciencias (The City of Arts and Sciences) which includes some pretty impressive looking buildings, loads of playgrounds, running paths and little shady spots for the citizens to just stop and watch the world go by. You could easily spend the entire day purely sticking to this stretch of the city. We didn't as we only had a day and had a lot to take in. This meant a lot of walking, which given the lovely weather wasn't so bad. The old part of the city is definitely the best part for sight-seeing. After a long hard day of walking and sight-seeing, we headed back to the car, found our way to the Carrefour on the outskirts of the town, did a little bit of shopping (as things would be closed over the next few days as the 12th of October is a national holiday in Spain) and trundled back to the villa in the dark. Valencia has a lot to see and there is no way we saw everything. This is definitely somewhere we'll be coming back to in the future, probably for a weekend break. Yup, we went to Benidorm, drove in, gasped, pointed and cringed at the hideousness of it all and drove right out again. The car only stopped long enough for the lights to change. Benidorm, or at least the main bit we saw is horrible. It's a sea-side town full of high-rise holiday apartment blocks with the street level filled with all of the worst cheapest and nastiest things from many British sea-side resorts crammed into one place. Everything is British this, English that. Arcades, pubs, clubs and cheap garish tat shops with EVERYTHING being aimed at the Brit who wants to avoid everything Spanish and have a part of Britain in Spain. The part of the town we saw is the epitome of Brits abroad. Things are so bad, the one Spanish restaurant I noticed amongst all the English places had to advertise itself as a traditional Spanish restaurant! I couldn't believe it. 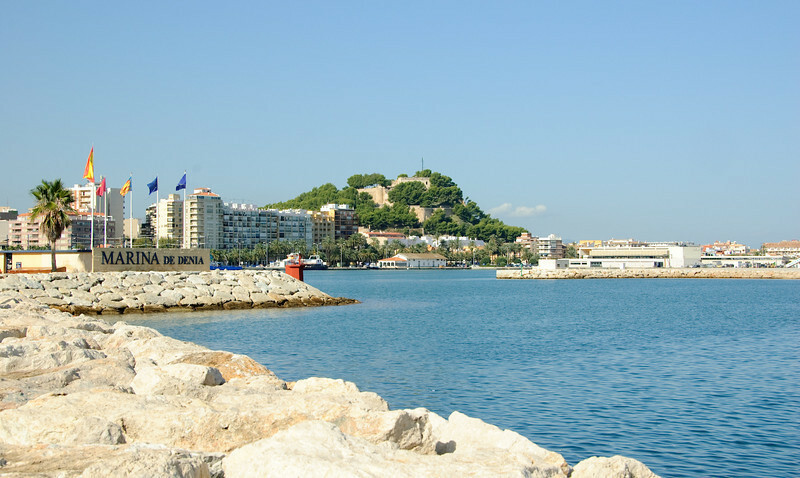 I'm probably not giving Benidorm much of a chance, but if first impressions are anything to go by, I can confidently say I will NEVER stay in Benidorm, and I think the only time I'll ever go back is to show friends and family how hideous it is. It'll be like a trip to the zoo. Apparently the Spanish really like Benidorm. I know why. They can go on holiday to Britain without having to use funny money or fly. They just drive in, experience Britain-on-sea and drive back to the safety of their Spanish countrymen safe in the knowledge they've experienced a little bit of Britain, unless of course they go to a different part of Benidorm, in which case I want to know more. To try and make up for things, we stopped in for lunch in Altea on the way back. Not much to see in this small Spanish sea-side town in the rain, but it was a pleasure in comparison to the Benidorm we experienced. 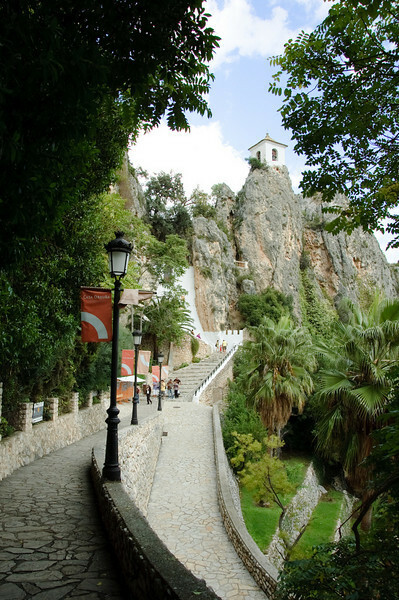 On the 14th we took our time to get up and out-and-about and headed inland slightly to a small little village in the hills called Guadalest. Guadelest is a tiny little village perched up in the mountains with access to the old part of the town being through a gateway cut in the rocks. The little village has spectacular views down the valley with a beautiful turquoise reservoir below. The town only has about 200 residents but sees thousands of tourists a day. After a gentle saunter around, we had a quick drink in one of the bars near the car park and headed back to the villa. The 15th was the last day of our holiday and we'd pretty much seen everything we wanted to. The only thing we hadn't seen yet was Gandia which was about an hour and a half up the coast towards Valencia. Gandia is known for it's very very long sandy beach, and boy was it long. Unfortunately, the bank holiday on the 12th seems to be the signal for the absolute end of summer as almost nothing was open. The weather wasn't brilliant at that time either so we didn't stay long in Gandia. We drove around for a bit, took a short walk along the beach front in Gandia and Daimus and decided we'd head back to Jávea again for some lunch. About two hours later we were seated on the beach pebbles in Jávea enjoying a spectacular tapas lunch whilst enjoying the last of the sunshine, turquoise sea and peace and quiet - things were definitely a lot quieter this time round in Jávea. After lunch we drove along the coast through the more touristy part of Jávea (Playa de Arenal) and along a coastal road to a rocky outlet called Cabo de la Nao (Cape of the Ship) which has some stunning views back over Jávea and apparently as far as Ibiza on a clear day. We couldn't see Ibiza when we were there, but the views were certainly good. Unfortunately, what the signs in the area don't tell you is that you can't actually travel back along the coast very far from here. You need to go back through Jávea to get further down the coast. We finished off the day by heading back to Benissa, the major town in which we did most of our grocery shopping, and followed some signs to the beach that I'd noticed - I wanted to see if they pointed to a beach that was closer than those at Calpe - they didn't as we soon found ourselves on the road to Calpe. We probably missed a turn somewhere but we weren't too concerned so turned back and headed home. The next morning it was up and out early for our flight back to Blighty and the end of our summer holiday. After two weeks, we got to really know and appreciate the villa and can say it fulfilled everything we could expect of it and then some. We do however have a few suggestions for improvement: it needs rugs. It's so big, especially the living room, that it echoes and echoes a lot. A few rugs would help dampen the echoes and make conversation easier. The TV also needs the Spanish channels. 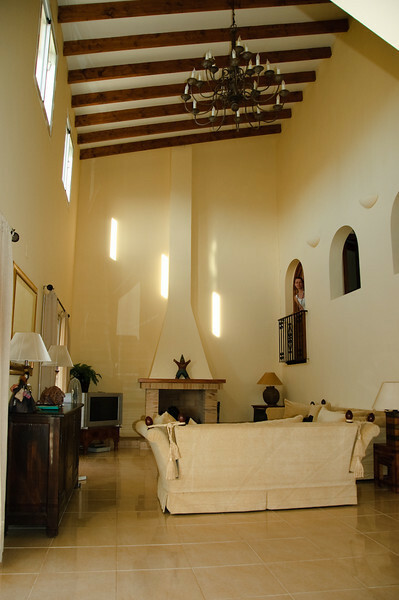 The villa has a great big satellite dish and a Sky box tuned to pick up as many of the the free-to-air satellite channels from the UK as possible, but no aerial so none of the local channels could be picked up. Watching a bit of local telly is a great way to tune your ear into the language in preparation of what you'll be encountering out and about. These are only minor niggles as the good weather meant we didn't spend much time indoors anyway. I'm also quite surprised at just how much spanish I do remember. I can't speak it too well, but I can certainly understand a fair bit, and this part of Spain speaks much slower and clearer than in Madrid, so it was easier to grasp too. All in all, we had a fantastic and well earned break. Renting a villa was definitely the right thing to do and something we'll definitely consider doing again in the future.